New book, 248 pages. This book provides veterinary support staff with essential information on administering fluid therapy. Encompassing catheter placement, monitoring of intravenous fluid therapy, long-term fluid therapy, intravenous nutrition, equipment, and potential complications, the book supports the reader in obtaining and maintaining intravenous access, monitoring patient responses, and reacting to changing in the patient's condition. With complete coverage of the principles and procedures, "Fluid Therapy for Veterinary Technicians and Nurses" offers both a solid grounding in the fundamentals and more advanced information for experienced technician. Designed for ease of use, each chapter begins with the basics, giving a thorough foundation of information, and then moves into more advanced information, with potential nursing concerns and complications highlighted within the text. A companion website offers images from the book in PowerPoint and review questions and answers for download. 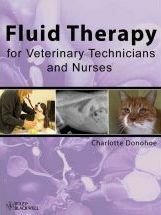 "Fluid Therapy for Veterinary Technicians and Nurses" is a useful resource for experienced veterinary technicians and vet tech students alike. Key features: Comprehensive resource on the technician or nurse's role in administering fluid therapy; Covers catheter placement, intravenous fluid therapy monitoring, long-term fluid therapy, intravenous nutrition, equipment, and potential complications; Presents both basic principles and procedures and more advanced information to appeal to new and experienced technicians alike; Highlights potential nursing concerns and complications Includes access to a companion website offering images in; PowerPoint and review questions and answers at www.wiley.com/go/donohoenursing.